You are invited to join us as we recognize students in grades 5-8 who earned a place on the Honor Roll for the second quarter. 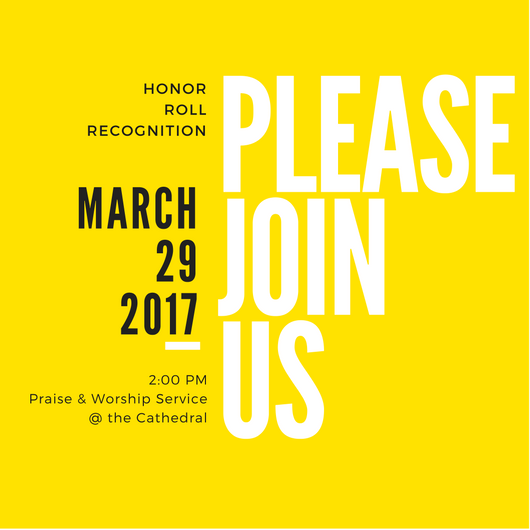 Honor Roll recognition will take place in the Cathedral following the 8:00 AM Mass. You are invited to join us as we recognize students in grades 5-8 who earned a place on the Honor Roll for the first quarter. Honor Roll recognition will take place during morning prayer. Wednesday, November 7th – 7:50 a.m. in the school gym. Honor Roll will be announced Thursday morning after Morning Prayer in the gym. All are invited. Monday is the 50th Anniversary of the dedication of the Cathedral of the Sacred Heart. Most of the school children will be attending the 8:00 am Mass. Bishop Wack and Father James will be celebrants. Honor Roll recognition will take place in the church following Mass, not in the gym as originally planned. Eighth grade students should wear their leadership uniforms. as we recognize the hardworking students who earned a place on the honor roll for first quarter.